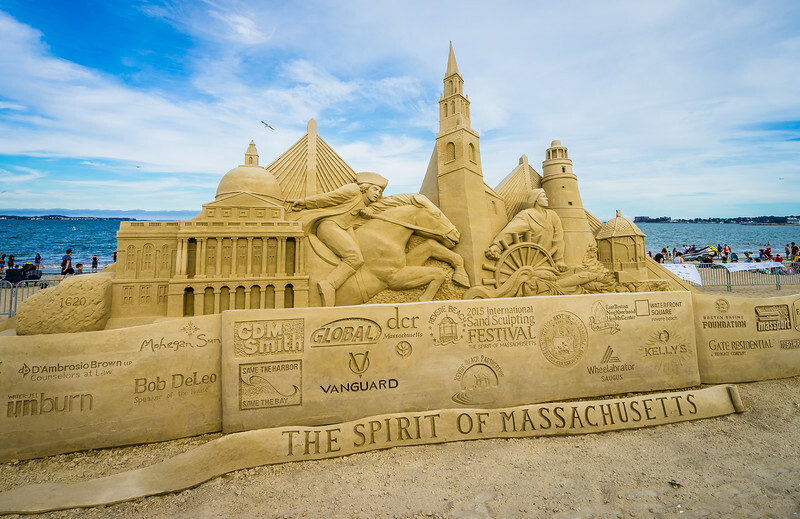 The World-Renowned International Sand Sculpting Festival will showcase Massachusetts as a leader in Science, Technology, and Innovation on Revere Beach from Friday, July 22nd to Sunday, July 24th, 2016. The annual festival draws upwards of 900,000 spectators from all over the country who come to watch master sand sculptors compete for first prize in the solo and duo portions of the Master Sand Sculpting Competition. The festival also features gourmet food trucks, live entertainment, local vendors, exhibit booths, children’s sand sculpting lessons, and fireworks over the course of 3 days. Sand sculptors for the Solo Competition are as follows; Melinage Beaureguard of Montreal, Canada, Guy Oliver-Deveau of Montreal, Canada, Pavel Mylnikov of Moscow, Russia, Benjamin Probanza of Acapulco, Mexico, Kevin Crawford of Perth, Australia, Jonathan ‘Jobi’ Bouchard of Montreal Canada, Jooheng Tan of Singapore, Marielle Hesseles of The Netherlands, Nikolay Torkov of Moscow, Russia, and Leonardo Ugolini of Italy. Duo Competitors for this year are; David Durcharme of British Columbia with Enguerrand David of Belgium, Steve Topazio of Tiverton, RI with Deborah Barrett/Cutulle of Saugus, MA, David Belcher of St. Louis, MO with Marianne van den Broek of Key West, FL, Paul and Remy Hoggard of Bulgaria, and Abe Waterman of Prince Edward Island with Morgan Rudluff of Santa Cruz, CA. This year’s festival will run Friday, July 22nd to Sunday, July 24th, 2016 and has a theme of Science, Technology, and Innovation. The event will highlight Massachusetts as a leader in the development and implementation of new and emerging technologies and discoveries by showcasing the innovation that is happening right here. Hours for the 2016 Revere Beach International Sand Sculpting Festival on Friday, July 22nd and Saturday, July 23rd are 10:00 a.m. to 10:00 p.m., and Sunday, July 24th 10:00 a.m. to 8:00 p.m. Admission is free and open to the public. It is recommended to use the MBTA and public transportation to and from this event. The MBTA Blue Line can be taken to the Wonderland or Revere Beach stops. Free parking and shuttle service to the T will be available at Suffolk Downs. Parking is also available at the Wonderland Garage. For more information about the event or to learn about sponsorship opportunities, please visit www.internationalsandsculptingfestival.com. About Revere Beach Partnership: Formed in 2001, the Revere Beach Partnership is a 501(c)(3) non-profit organization established to carry forth the heritage of Revere Beach as a nearby retreat for New England families, preserve the beach’s unique historic and natural assets, and plan and oversee the continued improvement of Revere Beach. For more information, visit www.reverebeachpartnership.com. This sounds like a very interesting contest. I like that there are competitors from all over the world. I hope that the entries will be posted on Facebook or in the news.